Give the defense a break. Notre Dame has reasons to worry after last Saturday’s performance against North Carolina, but the No. 1 concern shouldn’t be the defense, even as the Irish head to Tallahassee, Florida for a matchup against a marquee offense. Yes, the defense faltered at times and surrendered 43 points. But it’s important to remember just how stifling Notre Dame’s defense had been up until that point. Even after the mishaps against the Tar Heels, the defense is tied for eighth in the FBS in terms of points allowed per game. Florida State’s potent offense will be a next-level challenge, so the defense will have to play cleaner or the offense will end up in an inescapable hole. The offense, however, can play better defense too. It starts with Everett Golson protecting the football. Notre Dame has scored more than double the points of its opponents, holding a 207-103 overall advantage in total points. Hand the ball over to the opponent deep in your own territory enough times, however, and even an elite defense will struggle to minimize the damage. The Irish paid the price when North Carolina scored two quick touchdowns to open the game. Notre Dame overcame turnovers with a 50-point performance, but it came against a defense that had given up 70 points to East Carolina. Florida State’s defense is 30th in the FBS, giving up 20.7 points per game, but that’s a whole lot better than the Tar Heels’ defense. Spot the Seminoles 14 points and good luck making a comeback. Golson has the talent to pick apart Florida State’s defense when he plays like the quarterback who inspired Heisman chatter after the first couple games of the season. Even as he has become inconsistent, he still makes remarkable plays (witness: fourth-and-11). But as the Irish roll into Tallahassee to play the country’s No. 2 team on the road, everyone needs to fold consistency neatly right next to jaw-dropping athleticism in their suitcases. Golson has averaged 280.5 passing yards per game and has rushed for 209 total yards on the season, the second-highest total on the team behind sophomore running back Tarean Folston. He owns a 62.5 percent completion percentage and has thrown for 16 touchdowns. Reigning Heisman winner Jameis Winston averages 321 passing yards per game, with a 70 percent completion rate and 11 touchdowns. Both Winston and Golson have powerful arms and can be electric playmakers, so this game is shaping up to be a quarterback showdown. Even if the Irish defense plays its best, the Seminoles will score. They average 39.0 points per game — not a shutout team. Florida State features three productive rushers and a receiving corps led by senior Rashad Greene, although the Seminoles have experienced a drop-off in production behind their No. 1 receiver since last season. The Irish can contain Florida State, but they won’t shut the Seminoles down. That wouldn’t even be a fair expectation for the defense. That doesn’t mean, however, that Notre Dame can’t outplay Florida State. The Irish have talent and good reasons for confidence if they can keep their heads above the mistakes of last week. Notre Dame has a hard-to-shut-down offense and could outscore Florida State if Golson plays like the quarterback who started the season. 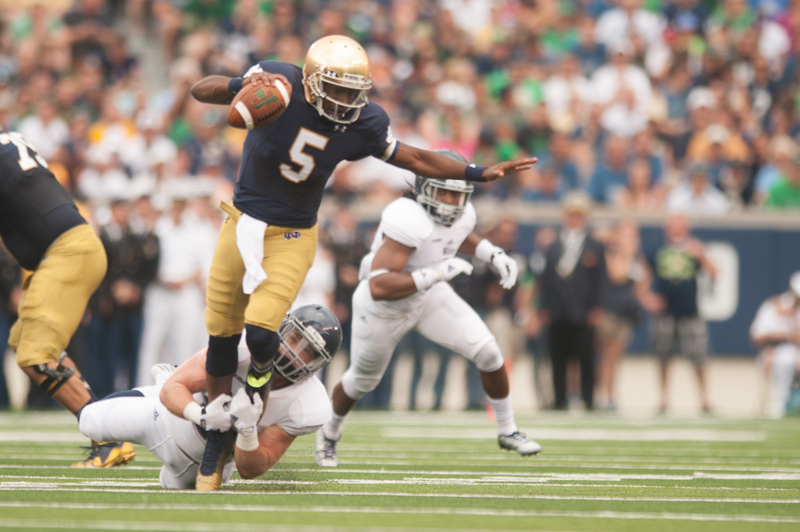 In the first three games of the season — against Rice, Michigan and Purdue — Golson committed zero turnovers. Since then, Golson has had three turnovers against Syracuse, one against Stanford and two against North Carolina. The Irish are lucky to have Golson at quarterback because he has the potential for games like this season’s first three. His talent and fine work as the offense’s leader aren’t wiped away by six unfortunate plays, not when there’s a more important number six: 6-0. He’s gotten Notre Dame this far, and there’s reason for Irish fans to hope he can come through again.